Review posted June 17, 2016. Simon & Schuster Books for Young Readers, 2015. 231 pages. The captured wolves wear golden chains and are taught to sit still while people around them laugh and drink and blow cigar smoke into their eyes. They are fed caviar, which, quite reasonably, they find disgusting. Some grow so fat that the fur on their stomach sweeps the ground as they waddle up and down stairs and collects fluff and ash. But a wolf cannot be tamed in the way a dog can be tamed, and it cannot be kept indoors. Wolves, like children, are not born to lead calm lives. Always the wolf goes mad at the imprisonment, and eventually it bites off and eats a little piece of someone who was not expecting to be eaten. The question then arises: What to do with the wolf? Aristocrats in Russia believe that the killing of a wolf brings a unique kind of bad luck. It is not the glamorous kind of bad luck, not runaway trains and lost fortunes, but something dark and insidious. If you kill a wolf, they say, your life begins to disappear. Your child will come of age on the morning that war is declared. Your toenails will grow inward, and your teeth outward, and your gums will bleed in the night and stain your pillow red. So the wolf must not be shot, nor starved; instead, it is packed up like a parcel by nervous butlers and sent away to the wolf wilder. The wilder will teach the wolves how to be bold again, how to hunt and fight, and how to distrust humans. They teach them how to howl, because a wolf who cannot howl is like a human who cannot laugh. And the wolves are released back onto the land they were born on, which is as tough and alive as the animals themselves. Feo and her mother are wolf wilders living a hundred years ago just south of St. Petersburg. The story begins when an old general named Rakov bursts into their home with a dead elk, claiming that their wolves killed it. (It was not one of the wolves still with them, since the jaw marks were of a smaller wolf.) They are told that if aristocrats bring them any more wolves, they must kill them, which of course Feo and her mother have no intention of doing. They are told that if Feo is seen with a wolf, Rakov’s soldiers will shoot the wolf and take the child. Feo and her mother make plans to escape if the soldiers come again. When the next wolf is brought to their door, a soldier does see Feo with it. But this soldier is only a boy. 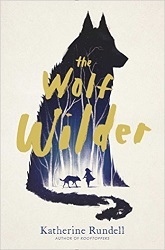 When the wolf gives birth to a tiny cub, the boy, Ilya, can be convinced not to tell. Eventually, Ilya does warn them – the soldiers are coming. However, their escape doesn’t go as planned. Though Feo and the wolves escape to the wilderness, Feo’s mother is taken away, and their home is burned. The main story is of surviving in the snowy woods as Feo and Ilya travel with the wolves to St. Petersburg to rescue her mother. Along the way they meet a teen who is trying to stir up revolution. Their village was destroyed by Rakov. The writing style in this book evokes mythology and fairy tales; it’s beautifully crafted. The story is tense and gripping – just when you think they’ve escaped Rakov, he keeps turning up again. Realistically? All along it was hard for me to believe that Feo would have any chance of rescuing her mother from the prison in St. Petersburg. When it came to it, the plan was plausible, but I still had some trouble with believability. Also, the first people they convinced to join in their “revolution” were children. I knew it’s a children’s book, so it would probably work out – but that could have gone just so horribly wrong. A character does say that soldiers don’t like to shoot children when people are watching, but based on some of the other things the soldiers do in this book, that didn’t make me feel safe for them. The book also pretty much portrays the Russian Revolution as a good thing, a thing to get children involved in. And okay, it does show that there was injustice in the tsar’s Russia. But I had mixed emotions about that, too. Summing up, this is, in fact, an excellent book for animal lovers, but they should be animal lovers with a high enough maturity level to read about violence and war. Those children who do tackle this book will find adventure and a sense of justice and children who triumph against long odds and characters, human and animal, who will stick with them long after they put the book down.